Good evening! I apologize for being so late with my Digit-al Dozen manis! I came down with a nasty bug this week and have been super sick. I finally managed to get a mani done for day 2. I have all of my manis planned, I just have to have my body cooperate so I can create and share them! 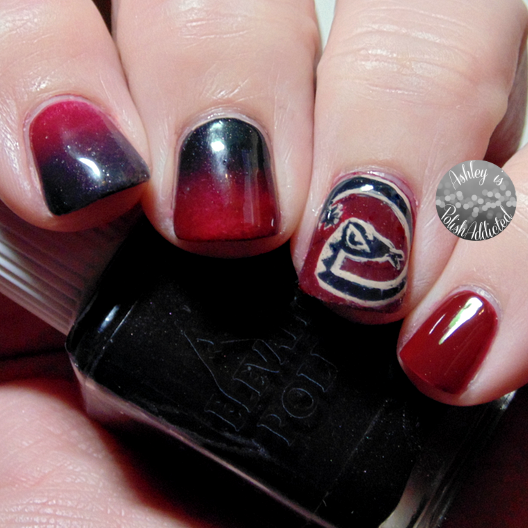 So, for today I am sharing my love for the Arizona Diamondbacks! I love baseball and I love my Dbacks! I have wanted to create a mani based on their logo for awhile but it was a daunting task. It took forever but I am pretty happy with how it turned out! I hope to be back tomorrow with one or two more Digit-al Dozen manis! Don't forget to check out all of the other amazing fandom manis below. You nailed the logo perfectly! Good for you, especially considering your not at 100%. Get some rest lady! I'm loving the gradient! Hope you're back on your feet soon. This is super accurate and finely detailed. Great job Hun! Feel better too. This looks amazing! You really nailed the logo! Wow! You painted the picture perfectly! Awesome freehand skill! Your logo turned out amazing! I never thought to do sports teams! Your logo is awesome!